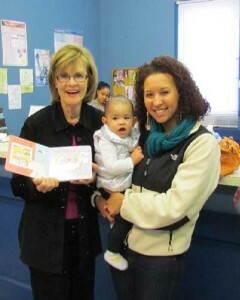 Cathy Leiber with the first mother and child to receive a “Birth-2-Five” book at HCLV. We believe that when children are not read to before they start school, it is probable that they will never catch up. Unfortunately, most, if not all, of these children come from families of inter-generational poverty, where a book is low on the list of priorities. Research shows that by age three, a child in poverty hears 30 million fewer words than a child from a middle-income home. Not only do they have smaller vocabularies, these children lack the confidence and competence to compete with their classmates who have spent their pre-school years nose-deep in books. A book can change everything. In order to increase the success of our collective future, we partnered with the Women, Infants and Children (WIC) supplemental nutrition program at two Lehigh Valley, PA locations: Casa Guadalupe in Allentown and Hispanic Center Lehigh Valley in Bethlehem. The idea was simple: donate custom libraries and give books to children aged birth to five at every quarterly visit. These books foster a life-long love of reading that will close educational gaps and open future doors of opportunity for these families. 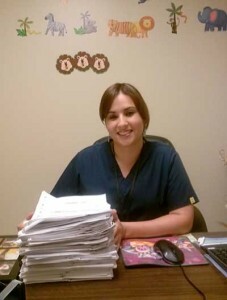 Nearly 5,000 pledges have already been signed since the start of the program. 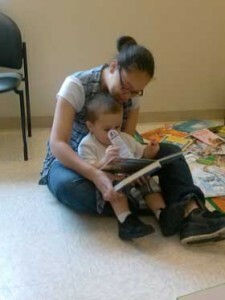 A mother reads to her child at Casa Guadalupe. During the summer of 2013, we conducted qualitative research to observe the reading skill and interest levels of children in the “Birth-2-Five” Program. In 51 hours, we read aloud to and observed 92 children, noting their behaviors throughout each interaction. What we found was that though children showed an interest in books, a majority of children did not possess all of the foundational skills to set them up for academic success. Such results emphasize the importance of programs like the “Birth-2-Five” program to prepare children to start kindergarten ready to learn.